The trails starts off downhill towards the mouth of the canyon. Castolon Mountain looms in the distance. Getting there: From the center of Big Bend proceed south west on the Ross Maxwell Scenic Drive toward Castolon. The hike begins along the right side of the road near the 20 mile marker. Look for signs along the road. It should not be too hard to find. 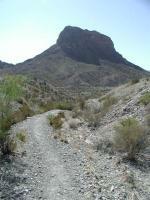 The Hike: This short hike highlights some of the varied and interesting rock formations that can be found in Big Bend. Start off near the waypoint marked "Trailhead" and follow the path of the trail towards the southwest. Off in the distance sits Castellan Mountain, which dominates the sky in this part of the park. The path slopes down to the mouth of the canyon and then makes a near 180 degree turn and heads northeast into the canyon. The trail surface varies from sandy to rocky, but none of it is too difficult and overall the length of the hike is rather short. We found the biggest burden of the hike was a couple of biting flies that refused to leave us alone. The trail surface changes from rocky to sandy in several places. 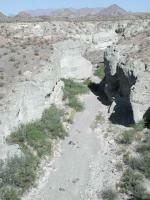 Tuff Canyon gets its name from the material that lines the steep walls on either side of the trail. Tuff is volcanic ash that has hardened into rock-like forms. The texture of tuff is abrasive and the coloration light. Despite the tough sounding name, tuff is not all that hard. In fact it erodes more rapidly than other types of rock. This is why the canyon walls here are so pronounced. Further up the trail a lava flow of harder rock shows it has faired much better from the occasional gully washes that flow through here. The Tuff contains numerous rock chunks embedded within it. When volcanoes spew lava, rock and ash into the air it does not all settle down in segregated clumps. 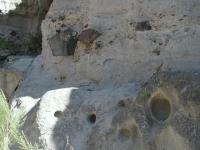 There's some mixing of elements and this can be seen in the canyon walls. Note that the whiter tuff is often peppered with darker chunks pebbles, rocks and occasional boulders. As the tuff erodes its hold on some of these embedded stones gives way. This leaves holes in the tuff that can also be seen. When you near the waypoint "Turnaround" you'll come across the harder lava rock that resists erosion better than tuff. The canyon floor almost disappears into a wall of hard rock. The trail could be extended somewhat, though from that point you'll be facing some climbing and very rough terrain. For a further appreciation of the canyon and the forces at work here the park has placed several viewing stations on the edge of the canyon cliffs above the trail. The station that is most north provides a good view of the lava rock wall and the tuff canyon below it. From this vantage point the stark contrast in the rock and tuff's reaction to erosion can be seen. This is a very short hike at less than a mile round trip, but well worth the effort, particularly if combined with some other excursions, such as the Santa Elena Canyon hike. Before you hike down into the canyon valley and into Tuff Canyon, be sure to visit the 3 scenic vista platforms that give you splendid views of the Canyon. My favorite vista is the East Overlook, which allows you to see where the canyon ends. 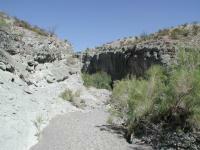 After you've seen the canyon from above, you can take a separate trail down to the canyon valley and into Tuff Canyon. The walls on each side of the canyon are quite impressive. An easy and quick hike. Must see! The second of two easy hikes for us today as we rested from our big South Rim hike the day before. The walls of the canyon here were very interesting. There's also an observation deck that overlooks the small canyon. The most interesting thing about this hike was walking through the canyon which has been pock marked by little holes all through the walls which have become homes for bats. We could hear the bats as we walked along the bottom of the canyon.